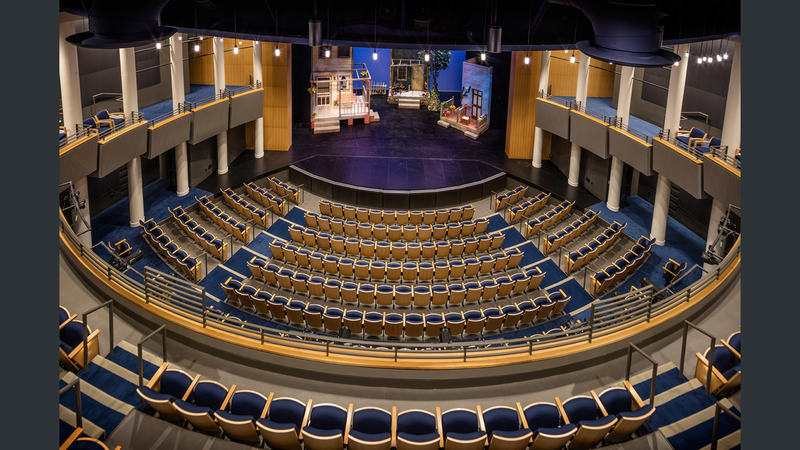 G2LD was proud to be a part of the design team for A.D. Players Theater. 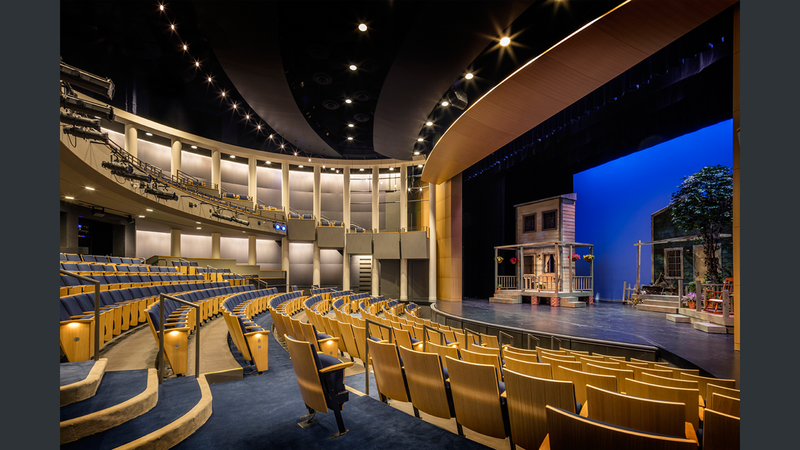 The new building represents phase 1 of the Galleria-area performing arts facility, designed by Gabriel Architects (architecture) and Studio Red Architects (interior theater), and encompasses 33,000 square feet including the Main theater, lobby, offices, scene shop, green room and dressing rooms. 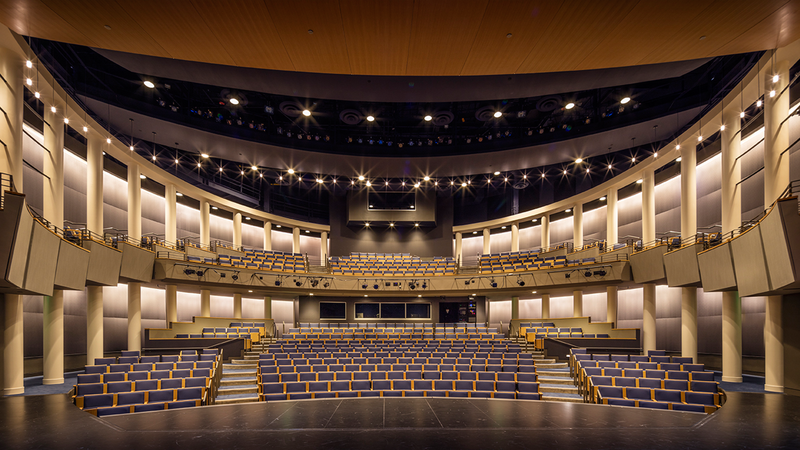 Among the areas G2LD was responsible for: exterior, facade, parking, theatrical house lights, and lobby, with its dramatic curtain wall and double height 'drum'. 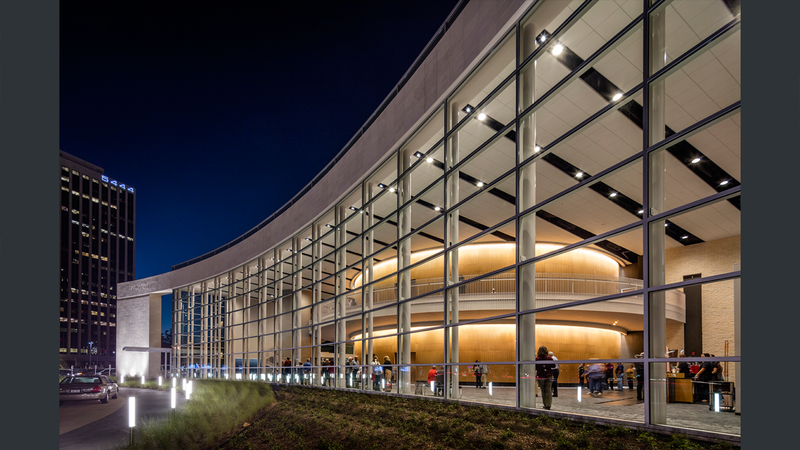 The curved entry drive to this impressive evening façade is lined with glowing bollards, which both line the way for the cars and add to the theatrical feel of the facility. This starry look is repeated inside the theater with a halo of miniature LED pendants. 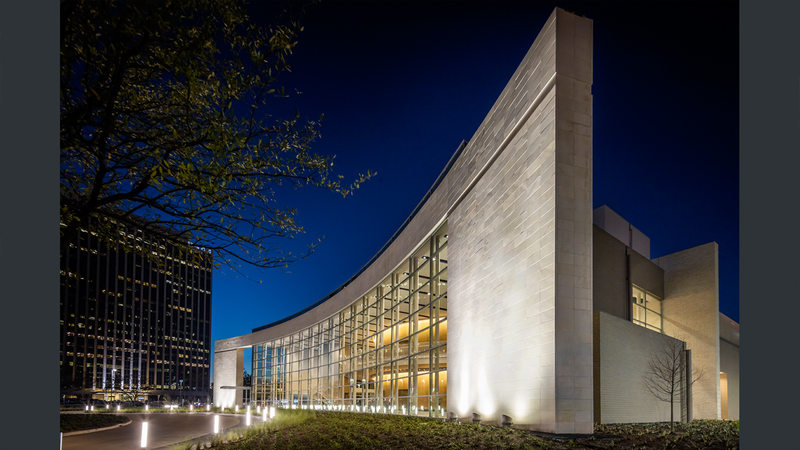 The impressive wing walls of the front façade are washed in light, announcing the theater’s presence in the urban landscape. 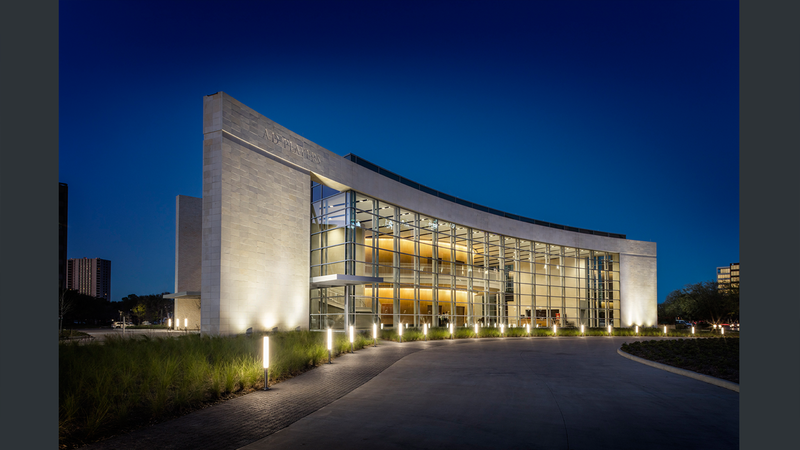 With its prominent urban location, lobby lighting was crucial so that the impressive two story lobby would be seen in its entirety through the glass façade by passers-by on the busy thoroughfare. Radiused LED wall-grazers were used to wrap the cylindrical center on two levels, showing off the geometries and contributing significant ambient light to the lobby space. Dimmable fixtures throughout mean that the house lights can be used to cue the patrons to return to the theater. Interior lighting was crucial for letting the interior lobby be visible from long distances. 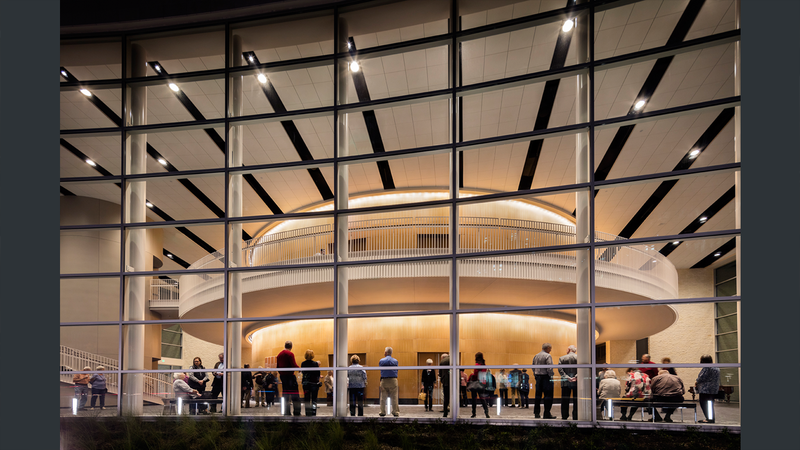 The outer walls of the theater, evenly aglow, serve as the centerpiece for the main lobby. 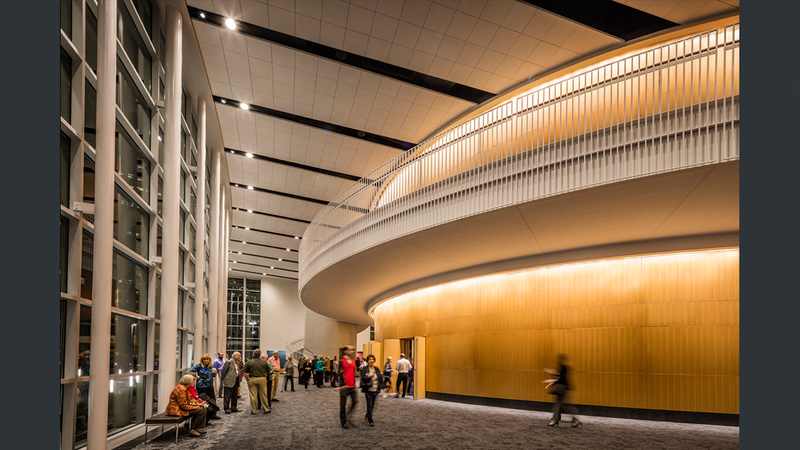 The LED wallwash which wraps the cylindrical center is able to both highlight the architecture and contribute significantly to the ambient light in the lobby, so that minimal additional downlights were needed. The radiused wallwash is picked up again inside the theater to highlight the architectural perimeter walkway. Dimmable LED cylinders tuck into the catwalks at the ceiling level to give an even wash to the seats so that audience members can easily navigate before and after the show. The main theater as seen from a side entrance, awaiting the evening’s patrons. A halo of miniature LED pendants at the balcony level accentuates the architecture while evoking the feel of a starry night. It also serves to draw the patron’s eyes away from the innerworkings of the catwalks and theatrical lights in the ceiling, allowing them to immerse themselves in the show. 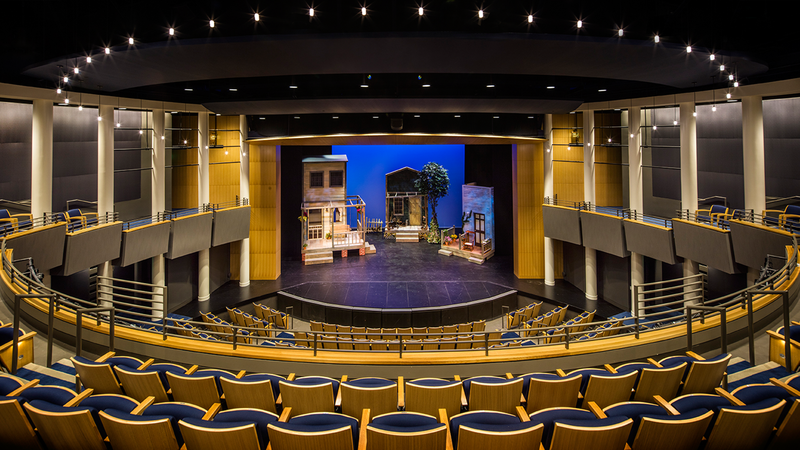 Dimmable downlights tucked into the catwalks above give an even wash to the seats, allowing for safe and easy navigation before and after productions. The main theater, as seen from the stage, with its majestic backlit colonnade serving as a backdrop to the seats.